Sterling Goa - Spread over 28 acres of Coconut grove on the Vagagtor Beach with Fort Chapora forming the back drop of the resort. 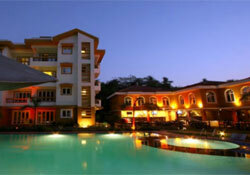 Sterling Goa is studded with cottages that have a Panoramic view of the Sea. The seafood of the restaurant is an epicurean delight. Fun, frolic, dance, music coupled with a taste of Portuguese culture is the theme of the resort. Room Facilities: Room Service, Attached bathroom with running hot & cold water, Television, Telephone, Minibar.